One of the features available in SQL Server 2008 is the ability to create and evaluate policies on different database components. The policy management feature allows an administrator to effectively maintain and enforce database standards on a server. 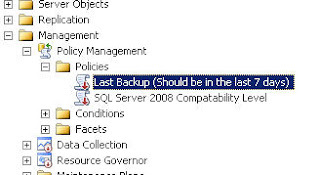 For example some of the policies would like to check the compatibility level of all the databases on a SQL Server 2008 database server, checking database backups (how recent the backups are..). There are lots of components on which policies can be created. The policies can be evaluated on demand or run on schedule. In addition to running standard scripts for database administration, policy management gives additional tool kit for the administrators. 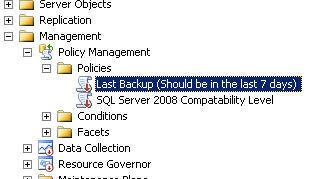 The policy management option appears Under Management in the Sql server Management studio. Here is a snippet of the policy management.